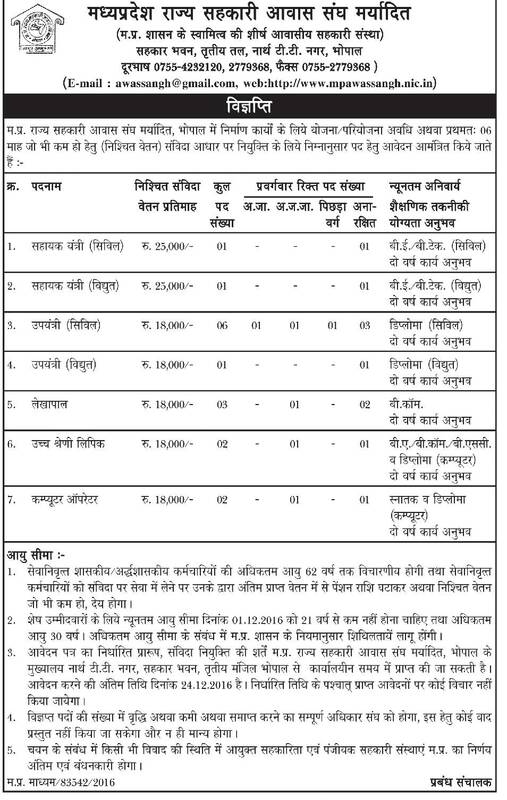 Madhya Pradesh State Cooperative Housing Federation Limited has issued a notice to invites applications against 16 Vacancies of Clerk, Engineer, Computer Operator Posts.Candidates with the required eligibility criteria are invited hereby for filling and submitting the application form through offline mode for the current openings on or before the closing date (24th December 2016). Essential Qualification Required: Job applicants, who are applying for above said posts must have completed Diploma (Computer / Civil) / Graduation Degree / Engineering Degree (Civil) from a recognized Board / University / Institute. The age of Appliers should be between 21 - 30 Years As On 01-12-2016. 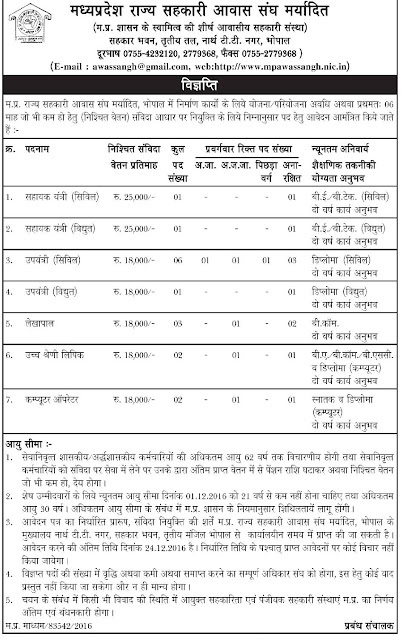 Salary Details: Selected Candidates will receive salary of Rs. 25,000/- (Post 1,2), Rs. 18,000/- (Post 3-7) and other benefits as per MPSCHFL Policies Circulars. How to Apply for MPSCHFL Recruitment 2016? Eligible contestants who fulfill the all term and conditions of eligibility must read all the instructions and information given on the notification cautiously and download the application format from official website of organization i.e. www.mpawassangh.nic.in. End Date To Submit Hard Copy of Application Form Is : 24-12-2016.